The submission deadline for papers has been extended to Sept. 22, 2017. 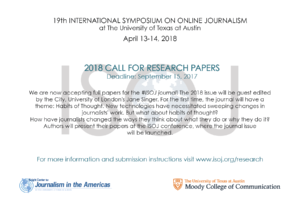 The International Symposium on Online Journalism (ISOJ) has a special call for papers for the 2018 #ISOJ Journal, which will feature original research about how journalists view their profession and their role during a time of incredible change in the industry. For the first time, Volume 8 of the #ISOJ Journal will feature a special theme, “Habits of Thought,” which will be guest edited by Jane B. Singer, director of research and professor of journalism innovation at City, University of London. According to Singer, although scholars and practitioners are well-versed in how journalists are responding to technological changes, not much is known about how journalists think of their role and motivations. In considering how this research might be useful for journalism educators, Singer noted that, in the classroom, career training generally receives more attention than creative thinking. The professor hopes the research from this journal will help to generate conversation on how to prepare journalists with greater critical thinking skills who can respond creatively to “real and compelling challenges” in the newsroom. 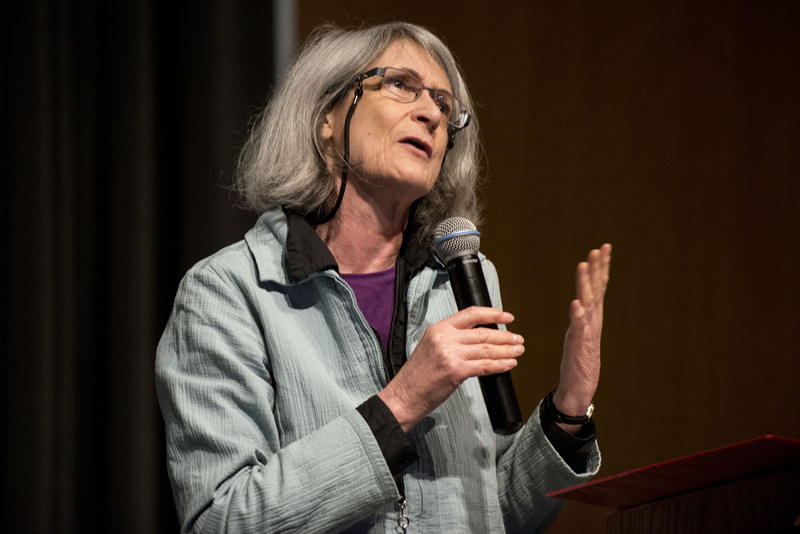 “Jane Singer is an amazing scholar and her special theme for the 2018 journal represents what ISOJ is – looking at the present and future of where digital journalism is heading. We are excited to see the research that is submitted for this guest-edited issue,” Schmitz Weiss explained. Singer, a journalist herself, was an early researcher of how journalists respond to digital technologies. She has her PhD in Journalism from one of the country’s preeminent journalism schools, University of Missouri-Columbia, and has had academic appointments at the University of Central Lancashire in the UK, as well as the University of Iowa and Colorado State University. “Before earning her PhD at Missouri, Dr. Singer was a journalist and a pioneer in online journalism. It’s great that someone who was there, in the trenches of the adaptation of journalism to the Internet, 30 years ago, is now leading this special issue of ISOJ journal, which is dedicated to the changes in the newsroom and in how journalists see their profession,” Alves added. The deadline to submit papers is earlier than in previous years. Remember to send yours by Sept. 22, 2017. For more information on manuscript guidelines and how to submit, please check the ISOJ website. For those whose papers are accepted for ISOJ, the authors will receive free registration to the conference. “Mostly, I’m interested in work that seeks to explore below the surface level of journalists’ adaptation to technological change to look at what’s happening inside all those clever heads in our contemporary newsrooms,” Singer said. The #ISOJ Journal will be published during the next ISOJ Symposium at the University of Texas at Austin in April 2018, where authors will present their work. The journal was launched in Spring 2011 at the 12th ISOJ, seven years after a research component was added to the conference. Previous copies of the journal are available at http://isoj.org/research/.